Ice cream probably evolved from chilled wines and other beverages, what we might nowadays call "slushies". Around 3,000 years go, the Emperors of China are believed to have enjoyed frozen delicacies made from snow and ice flavoured with fruit, wine and honey. In the 4th Century B.C., Alexander the Great is said to have been fond of iced beverages, and by 62 A.D., the Roman Emperor Nero is recorded to have sent fleets of slaves to the Apennine mountains to collect snow and ice to be flavoured with nectar, fruit pulp and honey. Legend has it that the great adventurer Marco Polo brought back recipes for water ices from China to Venice (Italy) in the 13th Century, however since the Persian Empire was already enjoying frozen fruit juice, teas, wines and liqueurs by then, it seems more likely that these products spread to Italy via Persia. The Arabic word charab is thought to be the source of the Italian word sorbetto, the French sorbet and English sherbet. Another legend says that Catherine de Medici of Florence took her Italian cooks and sorbetto recipes with her to France in 1533 when she married the duke of Orléans, who later became King Henry II. Charles I of England is then said to have purchased the formula for "frozen milk" from a French chef in the 17th Century. As they spread through the royal houses of Europe, eggs and cream also began to be added, and the frozen delicacies came to be known as "cream ices". However they arrived, we do know that water ices (sorbets) appeared in the 1660s in Naples, Florence, Paris and Spain. In 1660 an Italian, Francesco Procopio dei Coltelli, started to sell cream ices to Paris society from his Cafe Procope, which still operates today. Decorated frozen desserts became fashionable - the bombe glacee, parfait, coupe, and mousse. By now ice was being commercially harvested from frozen lakes, with salt added to lower the Freezing Point (and temperature) for more efficient storage and freezing. Prior to this, the difficulty of collecting and storing ice had meant that ice cream was an expensive luxury. In 1760 "The Compleat Confectioner" cookbook contained a method for making raspberry ice cream. The U.S. President's wife Dolly Madison created a sensation when she served ice cream as a dessert in the White House at the second inaugural ball in 1812. An American woman, Nancy Johnston, invented and patented the hand-cranked ice cream freezer (a similar concept to a butter churn, but with ice and salt packed around the outside) in 1843. By now, lake-harvested ice was being traded all around the world. The ice from Wenham Lake, Massachusetts in particular became world-famous for its clarity, harvested and distributed by the Wenham Lake Ice Company, founded by Frederic Tudor, who became known as "The Ice King". 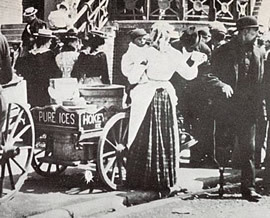 In 1851, the first ice cream "factory" (using manually operated churns) was set up by Jacob Fussell (pictured left) in Baltimore, USA. The first commercial ice-making machine was patented in Australia in 1855 by James Harrison. The machine had a 15ft flywheel and produced over 6000 lbs. of ice per day. Despite this, international trade in lake-harvested ice continued well into the 1900's. Further mechanisation of the ice cream manufacturing process took place in the 1880s and 1890s as electrical power was harnessed. The invention of the homogeniser by August Gaulin (France) in 1899 allowed a much smoother ice cream texture by micro-fining fat globules, and development of the brine freezer (1902) permitted faster freezing. At the St. Louis (USA) World Fair in 1904, a Syrian waffle vendor named Ernest A. Hamwi (pictured right) is credited with introducing the ice cream cone, when he started rolling waffles into cone shapes for the benefit of an ice cream vendor in an adjoining booth. The first circulating brine-chilled mechanical horizontal batch ice cream freezer, the Miller Globe Horizontal Brine Freezer, was introduced by Harry H. Miller of Canton, Ohio, USA, in 1904. The "Popsicle" is said to have been accidentally invented in 1905 by eleven-year-old Frank Epperson, when fruit-flavoured soda water was left outside and froze on a particularly cold San Francisco night, with stirring sticks still in place. The first home refrigerator was introduced by General Electric in 1911. Prohibition in the USA (1919) resulted in many bars being converted into ice cream parlours, and ice cream's popularity boomed. Ice cream novelties as we now know them began to appear in the 1920s - the first chocolate-coated ice cream bar, the "I-Scream Bar", appeared in the USA in 1919 (later re-named the "Eskimo Pie"), and the first ice cream on a stick was the "Good Humor Bar" (1920, USA). Both products are still on the market, as is the Popsicle! Anderson Bros. Mfg. Co. designed and built the first Eskimo Pie packaging machine in 1924, enclosing the ice cream bars in a fancy, gold-coloured foil wrapper. In 1926 a continuous scraped-surface freezer was developed by Clarence Vogt of Louisville, Kentucky, USA (pictured left). Vogt applied for 15 patents for his "Votator", which revolutionised ice cream production. The Cherry-Burrell Corporation bought the rights to his design, and began marketing the freezer, opening the way for true mass production of ice cream. In 1935 Gram refrigeration company of Denmark made the world's first automatic Ice Bar Freezer. The Neapolitan Three-Tube Vogt Ice Cream Freezer was introduced at the U.S. Dairy Exposition in 1956. It was the first freezer capable of producing three flavours simultaneously from one machine. Many further refinements to manufacturing equipment have taken place since then, but by this stage the basic technology was in place to produce the ice cream that we know and love today. - Sources: International Ice Cream Association and others. Photo: Sali Mahomet and ice cream cart, ca. 1903. The story of an industry that started out having to ship ice all the way from the East Coast of the United States, but which grew into a progressive and dynamic extension of the dairy industry, exporting product and technology back to the rest of the world. 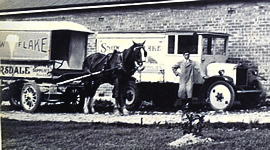 Photo: Delivery vehicles outside the new Riversdale Dairy - Snowflake ice cream factory, 1928 (detail). Hokey-pokey originally referred to the cheap and not very hygienic ice cream and ice milk sold by street ice cream vendors in the 1800's and early 1900's. In both the UK and America these vendors came to be called Hokey-Pokey Men. Ice cream was frozen, layered in a block, and sold in slices wrapped in paper. 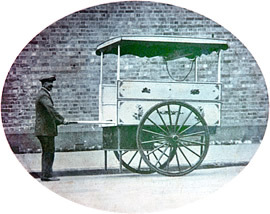 Swiss-Italian immigrants introduced the idea to Britain, and by 1850 Carlo Gatti was peddling ice cream to Londoners from a painted cart. It's possible that the term Hokey Pokey came from the Italian, "Gelati, ecco un poco!" ("Ice cream, here's a little!" or "try a little! ").